Pretty cottage sleeping up to 4 guests in the coastal resort of Polperro. Just a short walk from the shops, cafes, harbour, beach and entrance to the coastal path. With a garden, furnished sun patio and onsite private parking for your car. Great for couples or families wanting to relax and enjoy Cornwall. Perfectly situated for exploring the rest of Cornwall and South Devon, just 40 minutes from Eden, The Lost Gardens of Heligan, Plymouth's National Marine Aquarium and many other great attractions. Crumplehorn Cottages No1, No2 and No3 are pretty whitewashed Cornish Cottages situated in the coastal resort of Polperro - south facing for maximum sunshine in both summer and winter. Built in 1739 these gorgeous properties have beamed ceilings, sash or picture windows, a Cornish stone fireplace and lots of old world features to enjoy. With a pretty raised lawn and furnished sun patio at No1 and No2 - And a picket fenced lawn at No3 - The Perfect outdoor space for dining Al Fresco - Or to sit out on, to relax, unwind and watch the world pass by. With onsite private parking for your car - these beautiful traditional Cornish cottages will make your holiday in Cornwall one to remember. Crumplehorn Cottage No1 (Sleeping 2) is a PET FREE cottage - For guests with allergies. We do however ACCEPT an accompanying DOG at Crumplehorn Cottages No2, and Crumplehorn Cottage No3 (Sleeping 2 - 4 guests ) There is a pet fee of £30.00 pw. Please note we also have Shellseekers No1 and No2, pretty riverside apartments (Sleeping 2) in Polperro - For guests with accompanying pets. Guests would need to bring a small quantity of £1 coins with them. 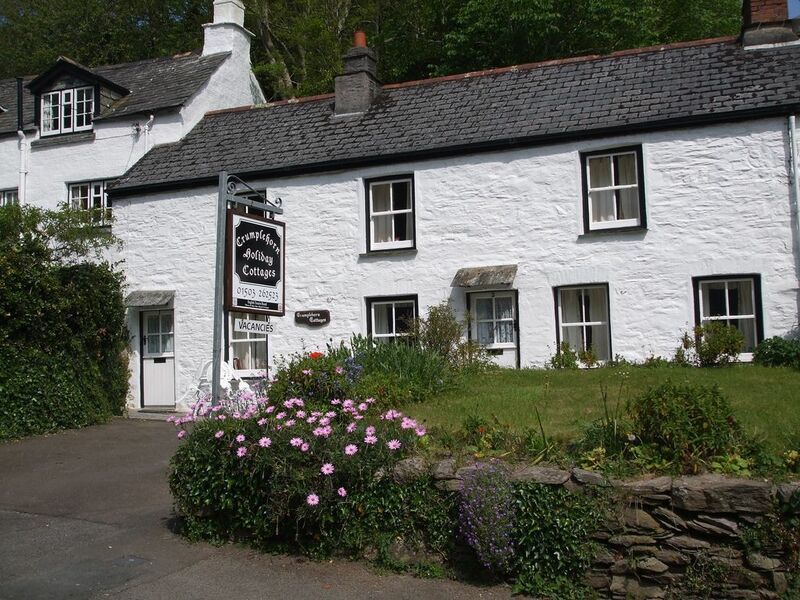 Owner/Manager at Crumplehorn Holiday Cottages, in the beautiful coastal resorts of Polperro and Looe, Cornwall. My family go back generation in the Polperro and Looe area - And I am proud to promote our beautiful resorts to our visitors. Living locally I am always on hand to offer help or advice should guest require any assistance whilst they are staying at our cottages. My parents bought their first holiday cottage back in 1964. (Wow! - We have been established for over 55 years now!) They decided that as they loved the area so much, that they wanted to be able to share the beauty and charm of Polperro and Looe with others too. I took the cottages over from my parents 12 years ago when they retired, and continue to pride myself on offering dependable - Quality, comfortable, clean accommodation. We are annually inspected and approved by QIC (Quality in Cornwall) Your guarantee of a great place to stay! This cottage is so pretty and unique, that author/TV presenter Judy Finnigan even has a character living in one of our Crumplehorn Cottages in her latest novel - I do not sleep. We keep a copy of her novel in the cottage for guests to read during their holiday. A beautifully poignant tale - set in Polperro. This beautiful cottage is situated in the actual coastal resort of Polperro, it also has the added bonus of onsite private parking for your car (An absolute MUST in Polperro, where parking is at a premium, and expensive if you don't have carparking included) Once you're at the cottage everything is just a short walk away, shops, Inns, cafes, restaurants, the harbour, beach and coastal paths - you can enjoy car free time in the resort. This cottage is so pretty and unique, that author/TV presenter Judy Finnigan even has a character living in one of our Crumplehorn Cottages in her latest novel - I do not sleep. We keep a copy of her novel in the cottage for guests to read during their holiday. A beautifully poignant tale - set in Polperro. Linen charged at just £5.00 per bed. Beautiful Cornish Stone Fire place with feature electric fire. Wi-Fi for accessing e-mails and social media during your stay! Dining table and four chairs - Highchair available upon request. CD player / Radio in the lounge. Notes on accommodation: Crumplehorn Cottage No3 is perfect for couples wanting a relaxing, romantic break in Cornwall, or for families wanting a beachside holiday. Also ideal for walkers, golfers, keen anglers and cyclists. Outside: There is a pretty picket fenced garden, with a furnished sun patio at the front of the property - Perfect for dining Al fresco. To the rear of the property there is a small grassed area with a washing line for guests to use if required. Guests can park their car in their own private onsite parking space for the duration of their stay at the cottage. We had a wonderful week in this lovely cottage. It had everything we needed and was in an ideal location for exploring the area. Thank you for looking after and leaving the cottage so nicely - It was much appreciated. We are so pleased that you enjoyed your stay, and we hope to see you again in the future. Lovely cosy cottage with everything you need for a relaxing stay in Polperro. My Dad had never been to Cornwall and had memories of chats with his Dad about Cornwall and a photo of his Dad at Polperro Harbour. We both enjoyed touring Cornwall and returning to the cottage for relaxing evenings playing cards after a few drinks in one of the many Polperro pubs. Dads dog loved the hill walks close to the cottage. Would definately recommend. Thank you for the lovely review, and for looking after and leaving the cottage so nicely - it was much appreciated. We are so pleased that you enjoyed your holiday in Polperro. It's such a pretty village. Had a lovely few days away here recently, the cottage was cosy but well laid out although the kitchenette was a little tight on space. Really easy to find being right on the main road into Polperro and a pub literally on the doorstep if you don't want to walk down into the village for an evening meal. Having a car parking space was really convenient and very easy to get out for a quick trip to Looe only 4 miles away. Polperro itself is very pretty and the people welcoming with several pubs serving really good fresh locally sourced food. We have stayed in a lot of properties in the South West and overall our stay was good value for the experience. The host was prompt and helpful, would definitely return - thank you, Victoria. Thank you for your great review, and for looking after and leaving the cottage so nicely - Much appreciated. We are delighted that you enjoyed your stay, and hope to see you back in one of our cottages in the future. Lovely cottage in ideal location. Crumplehorn Cottage is in an ideal location to enjoy the delightful village of Polperro and to explore the beautiful surrounding area. Having a car parking space at the cottage was a real bonus. Once the car was parked the village had plenty of good quality pubs and restaurants to eat. The cottage was very clean and had everything needed for a comfortable stay. The Manager was available to deal with any issues which might arise. I would definitely recommend this property and would stay there again if returning to Polperro. Thank you so much for looking after and leaving the cottage so nicely - It was much appreciated by myself and the cleaning team. And thank you for the lovely review. We are so pleased that you enjoyed your stay, and hope to see you back again in the future. Absolutely fabulous stay at Crumplehorn No. 2, everything you need is catered for, even a hairdryer ! We have been to 3 properties previously with Crumplehorn Cottages, but no 2 was perfect, have booked next year already ! It really is home from home and made Ian's birthday a bit more special. A beautiful cottage, very much admired. The food and service at Crumplehorn Inn is excellent. Thank you Victoria for making our holiday a little more perfect. Thank you so much for this super review. We look forward to seeing you again next year too! Absolutely fabulous stay at Crumplehorn No 2 everything you need is catered for, even a hairdryer ! We have been to 3 properties previously with Crumplehorn Cottages but No 2 was perfect. Have booked next year already. It really is home from home and made Ian's birthday a bit more special. The food and service at Crumplehorn Inn is excellent. Thank you Victoria, for making our holiday a little more perfect. My brother and co-owner Murray owns a private charter boat called "Swallow 2" which offers daily trips from the quayside at Looe. You can book to go Shark, Reef and Deep Sea Fishing. Call Murray if you'd like to book a trip to spend a day or even a few hours sea fishing during your stay at the cottage. Newquay 40 miles, Exeter 60 miles. Polperro has an abundance of shops, Inns, cafes, restaurants, and tea rooms - with so much choice, it'll be hard to decide where to go first! It also has a pretty Model Village and Land of Legend to explore, and a Museum of Smuggling which is on the harbourside overlooking the boats. There are boats leaving the quayside throughout the day for fishing and sightseeing trips, and miles of coastal path with secluded coves to discover! Booking Notes: We accept a one half deposit on booking, with the remainder due one month prior to arrival. For holidays which start within the month, the whole balance is due upon booking. We accept payment by debit card, £ sterling cheque and bank transfers - Free of charge. And by credit card with a 2% handling fee. Changeover Day: Our change-over day is on a Saturday during the main season, but can be flexible during low season. Notes on prices: We can also offer short out of season breaks - Please call or email through for prices. We accept one well behaved small to medium sized dog at Crumplehorn Cottage No3, by arrangement and a £25.00 fee for their stay. Crumplehorn Cottage No1 (Sleeping 2) is our pet free cottage.